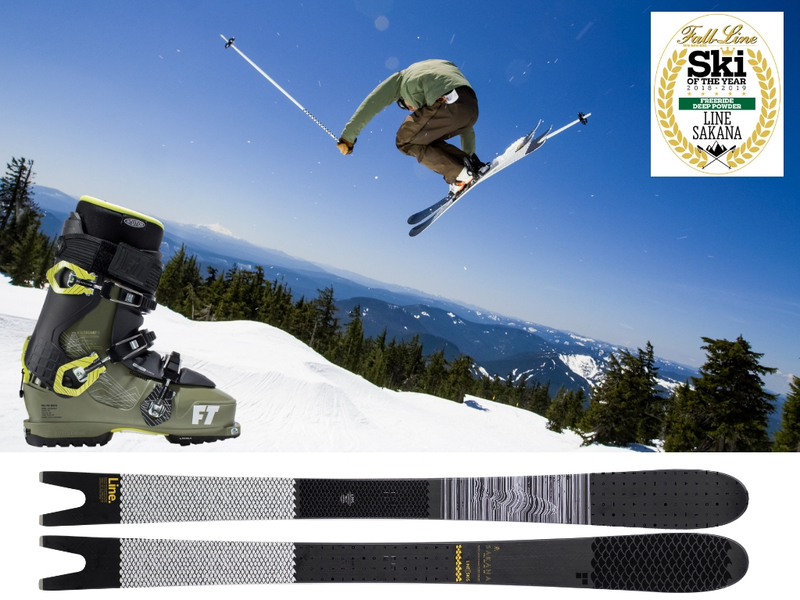 We’ve landed Fall-Line’s Freeride/Deep Powder Ski of the Year, the Line Sakana, plus a pair of Full Tilt Ascendant backcountry boots to give away to one lucky reader! That’s a whopping £1,115 of freeride powabunga kit you definitely need in your life. Every year at the Ski Test there’s a crazy-looking pair of planks that test teams fall over themselves to get their hands on. This year it was the Line Sakana. FL tester and coach/freestyle guru Andy Bennett aimed for it the moment there was a flutter of fresh. “It stands out from the crowd simply with the graphics and crazy shape,” he said as he eased it from the rack. The construction is trad sidecut with Line’s Partly Cloudy core, a mix of lightweight and denser woods which delivers enjoyable spring and response. Torsional flex makes the Sakana feel like it’s flowing over the snow, and it’s enormous fun to crank around all of the mountain thanks to the soft tip and aggressive sidecut. Its waist is 105mm. The swallowtail takes out some area, delivers a surfy ride and fires out a fine roostertail on piste. We like fun when we’re skiing, and the Sakana (worth £670) is a finely-crafted way to get it – hence it wasn’t a hard choice to name this Fall-Line’s Freeride/Deep Powder Ski of the Year 2018/19. As for Full Tilt’s Ascendant boot, all-new for 2018/19 and worth £445, here’s a tech-compatible boot that won’t sacrifice performance on the downhill. Three years in the making, this definitive all-around touring boot has been designed to take you farther, with optional walk soles, a Flex 10 Tongue that’s easily removed for the uphill, a Tour Cuff and the meticulously designed Tour Pro Liner. We’re super-stoked to have bagged these fabulous prizes for one of our readers. If you’re the winner – or any winner from this season or last – write and tell us all about the adventures you enjoy with your new kit! Hey Anita, enter your details above!